When you think about it, every day is Earth Day. But each year on April 22nd the world pays collective homage to the planet that sustains our lives and pauses to raise our awareness on how we can protect it. Earth Day began in 1970 as a grass roots movement aimed at inspiring us to appreciate our planet and protect it from human harm. According to scientists that harm is causing global warming of the planet resulting in extreme weather changes. And when bears can’t hibernate because temperatures haven’t dropped enough, and flowering plants in some of the coldest regions of our nation are blooming in the winter months instead of spring we need to pay attention. One way of helping planet earth is by reducing your carbon imprint. A carbon footprint is a measure of the impact that our daily activities have on the environment in terms of the amount of green house gases we produce, which is measured in units of carbon dioxide. Install a Faucet Mount Filter System. By switching from bottled water to a faucet mount filter system, you will not only save money, but you can help reduce the 300 million tons of plastic the world produces each year. 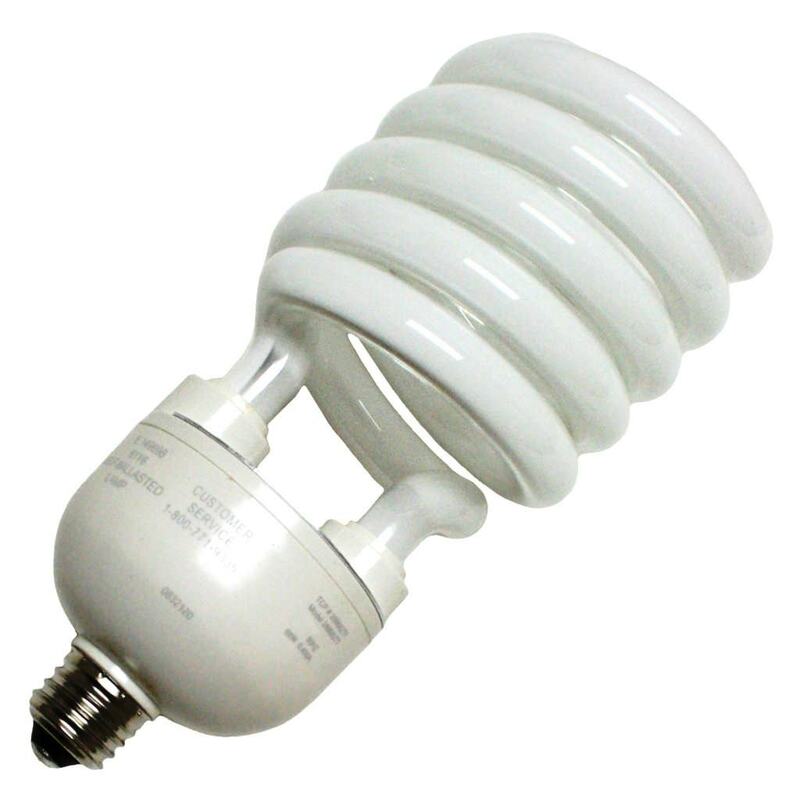 Replace your incandescent light bulbs with compact fluorescent lights (CFLs). CFLs reduce the release of greenhouse gas emissions and are safer because they burn at a significantly lower temperature than incandescent and halogen lights. They also last longer and use less energy than incandescent bulbs. Inflate your car tires. It can improve your gas mileage by about 3.3 percent — a savings of about 7 cents per gallon. With gas prices climbing, you can’t afford not to keep your ties inflated. Purchase Energy Star-labeled appliances. Energy Star products are the most efficient appliances and can provide a 30 percent return or better through lower utility bills. Wash and rinse in cold water. If we all used cold water, we could save about 30 million tons of carbon dioxide each year — and more than $3 billion in energy costs, collectively. Reduce, reuse, and recycle. It reduces the excessive amounts of fossil fuels and hydropower required to dispose of these materials. And those bottles and cans amount to dollars and cents and who couldn’t use a little extra change in this economy. Get out of your car and walk, bike, carpool or use public transportation at least once a week. Our cars are one of the largest sources of greenhouse gas emissions. Many cities like Los Angeles have bike lanes that extend throughout the city so it is a lot easier to bike it than it used to be. Use electronic invitations. Some of us use to balk at getting an email invitation. It seemed so impersonal and tacky. But the reality is most of us spend a large portion of our day managing our professional and personal business on-line. The benefits of electronic invitations are they save time, money and trees. Eat less meat. The meat industry is responsible for approximately 20% of the world’s greenhouse gas emissions. It takes more water to produce one ounce of beef (106.3 gallons) than an ounce of squash (1.92 gallons). As a general rule protein, processed foods and starches require more water to produce; fresh vegetables require considerably less. Buy local. Locally grown produce at Farmers Markets and now in some grocery stores are picked with 24 hours and travel fewer miles to get from the farm to your table. When produce doesn’t have to travel far, it is not only fresher and tastes better than food shipped long distances from other states or countries, it reduces carbon dioxide emissions and the use of packing materials. 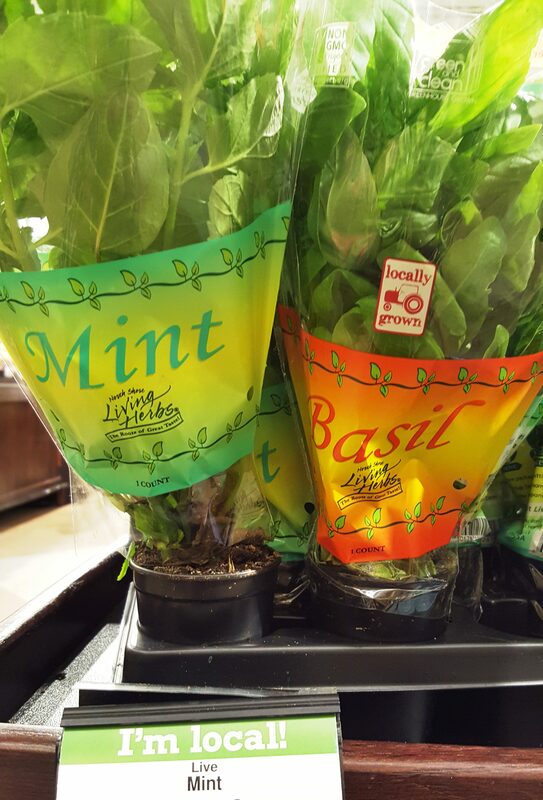 On a recent trip to my local Ralphs market, I was thrilled to see locally grown mint and basil, two of my favorite herbs. When I think of mint and basil, I think of pesto. 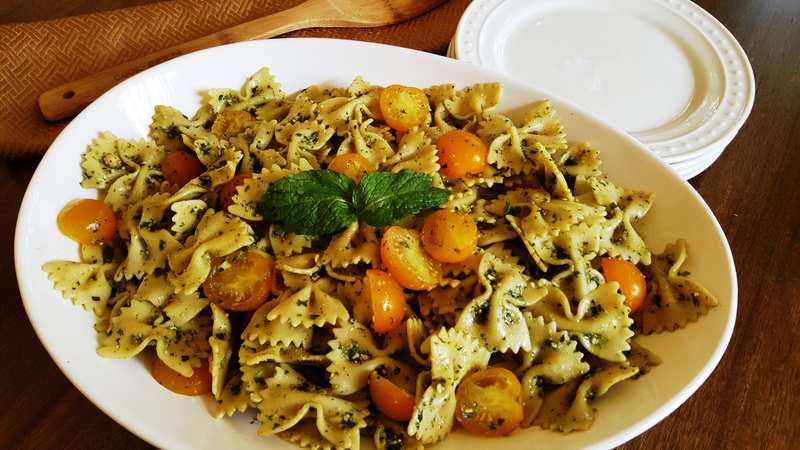 And after you try my easy mint and basil pesto pasta, you will too. This pasta dish is great for picnics, potlucks and family dinners. The mint perfectly complements the basil, and the use of pine nuts and Parmesan cheese make this pesto a tasty and memorable paring with pasta. I added yellow cherry tomatoes. But there is nothing stopping you from adding grilled corn, roasted red bell peppers, protein like grilled shrimp or chopped rotisserie chicken. No rules here – just buy local. Happy Earth Day to all. Now, go forth and do your part to help the planet. 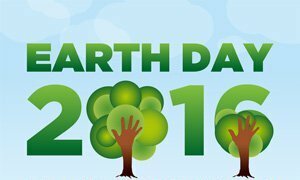 To learn more about Earth Day, visit http://www.earthday.org/. Cook pasta al dente, according to package directions. Remove from heat, drain and place in mixing bowl. Wash mint and basil leaves and removed from stems. Pat with paper towels until well dried. Place basil leaves, mint leaves, salt and Parmesan cheese into food processor and puree the ingredients until a paste forms. While processor is running, slowly add olive and blend thoroughly. Stir pesto mixture, cracked pepper and crushed red pepper into pasta. Add tomatoes. Place in refrigerator for one hour before serving. This entry was posted in Foodies and tagged and recycle, Basil, bike lanes, Bow tie pasta, Buy local. Locally grown, carbon dioxide, carbon footprint, carpool, caviar, CFLs, Cherry tomatoes, collard greens, compact fluorescent lights, Earth Day, electronic invitations, Energy Star products, Energy Star-labeled appliances, family dinner, Farfalle, Farmers Markets, fossil fuels, global warming, green house gases, greenhouse gas emissions, grilled corn, grilled shrimp, Happy Earth Day, hydropower, incandescent light bulbs, Kroger, Los Angeles, Mint, Mint and Basil Pesto Pasta, Parmesan cheese, pasta, Pesto, Picnic, pine nuts, planet earth, Potluck, public transportation, Ralphs, Reduce, reuse, roasted red bell peppers, rotisserie chicken. Bookmark the permalink.